Second release in a new series of small groups drawn from members of the Discus Music family. The concept is for the group to meet, write, rehearse and record in one single session - old school style! Ten compositions from all four players edited into a continuous sequence of structure and improvisation, embracing melody, texture and pure abstraction. Once again in collaboration with the fabulous Chilean artist Gonzalo Fuentes / Guerrilla Graphics. Amanda’s Drum is the opening track, I’ve no information about Amanda especially as the percussion on the album belongs to ‘Johnny’s drum’. It is Mr Johnny Hunter himself who crashes onto the scene at this party. If you’ve been reading in-between the lines of the Sandy Brown Jazz website over the last 18 months you’ll already know he is one of our favourite drummers. 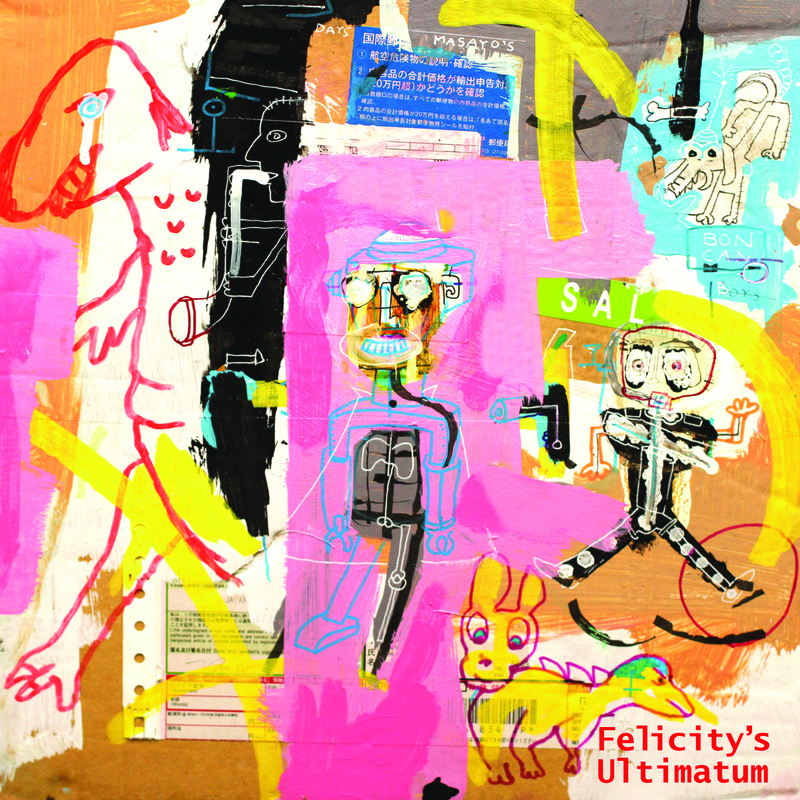 This album goes a long way to explaining why.The quartet line-up on Felicity’s Ultimatum is sonically balanced (plus, the whole album has 10 track titles naming particular women and their possessions – in Felicity’s case it isn’t an object, but a demand and she gets the title track). The vivid presence of Stephen Grew broods over this album, a detailed pianist capable of restraint as well as full-on crescendo; a player who keeps a low profile yet is among the most deeply inventive pianists in the UK. His solo album Lit & Phil Suite, reviewed in August 2015, is worth catching. Here in Martin Archer’s quartet Felicity sessions he acquits himself with aplomb, tirelessly sparking events whilst still holding up the middle ground, spraying tough and tender lines with purpose. Graham Clark’s violin is a smart addition. He’s a member of Archer’s small big band, Engine Room Favourites, and a number of other Discus projects. Years ago I used to catch Mr Clark in Bristol. He seemed to play every gig possible, and ended up in Europe in a late version of Daevid Allen’s Gong. Here he bows with stealth. On the short, Jane’s Ruin, it begins with Hunter and Grew stoking a fire of repeats and then you detune your ears to an awareness of Mr Clark’s strings gradually harmonising the picture until he is countering their statements. On Bessie’s Greens, in effect a ‘Bird’ Parker abstraction for Martin Archer, the violin turns the tables and produces a coda of guile and smooth grit. It’s beautifully executed. Of course, there is no bass player. I’m a believer in bass players, but sometimes if a substitution is made, or even, heaven forbid, the daring do of leaving the bottom end totally empty, what you get is a space. And space can be just as productive as filling it with time and motion. What you get on Felicity’s Ultimatum is a lot of light and air around Martin Archer’s sopranino and alto horns, particularly when chorusing with violin. When they need something deep down underneath there’s the occasional use of baritone sax to burnish the bottom. It also means that the Hunter-Drummer designs his own line – Sonya’s Goat could be modern be-bop if they let it, but the drums are constantly re-folding the rhythm round a circular improv catching on the hop the composition element. I’m not saying a bassist couldn’t have found a home here, but leaving the vacancy allows for an open door policy when it comes to running the voodoo down (so to speak). Okay, right in the centre of the running order is Masayo’s Experiment, one of two improvised workouts. I can reveal the worse kept secret ever, that Masayo Asahara is someone very close to Martin Archer’s heart, particularly since they share the same initials. Love it. Masayo’s Experiment sounds different to the other tracks. Same line-up, same recording session, but twice the length of most of the companion pieces, it positively tracks forth like searching for its own story. They wait for each other. Right at the beginning there’s this hint of strings and horn testing weight and wait. How long is he going to hold that note? How heavy is he going to make the irruption? Mr Grew’s entry seems to settle things down for a while, but damn, he drops out again. It is Martin Archer getting in touch with his Masayo Asahara which propels the quartet forward and it is Johnny Hunter flicking cymbals and fast hi-hat that presents everyone with a firm basis to heave in a dramatic central cascade. Turn it up! The foursome become ferocious. For a while they sound invincible until they eventually break down into a keyboard abstraction. And they grow space between them as if the empty quarter were additional colour. Mr Archer takes time out on each of his three horns. A reminder that despite his reputation as a producer/composer, he’s actually a soloist with a very broad range; a systematic sax maestro. Masayo’ Experiment leaves the speakers with Clark’s violin taking on what amounts to the classical form. I wonder what he’d be like in a Kronos Quartet set-up? My tip for listening to an album is always listen to the last track. How musicians choose to end a session is as important as how they begin. Agnese’s Fan (as in those whirring electric things, essential to life in Thailand if not in Derbyshire) begins almost silently. Agnese does not whir. There’s a filigree of Johnny Hunter percussion, cracking wood, low rushed rolls, soft strikes, crushed touches on cymbal bells. Unison lines from Clark/Archer throughout; Grew gracing a counter melody from in-between the air pockets. They all arrive at the end together, unhurried, harmoniously true, speaking through instruments which deliver an Ultimatum that I can only guess at. I don’t need to know the detail. I have just played Agnese’s Fan four or five times. If they have the time to take five and half minutes to play it, I certainly have half an hour to examine my own response. This is music. No one has come here to mark time. On ‘Felicity’s Ultimatum’, a different blend of instruments produces a different set of musical patterns. On first listen to this, I wasn’t aware that the quartet lacked a bass, so compelling was the rhythmic drive across the 10 pieces. Here, Archer works with the violin on Clark (a member of Archer’s ‘Engine Room Favourites’ small big band, as well as Gong and the Magick Brothers), the piano of Grew (who, amongst other projects, duets with saxophonist Trevor Watts and plays in the improve-electronic ensemble Grutronic) and Hunter (also of Engine Room Favourites) on drums. On several tracks, saxophones and violin work together as one pair, and drums and piano as another. So, on ‘Jane’s Ruin’, track 2, sax and violin provide a sort of drone as backdrop to the punchy exposition of the theme by piano and drums, or on ‘Bessie’s Greens’, track 3, sax and piano play a sort of blues theme, punctuated by piano and drums. What I enjoyed was the ways in which Grew and Hunter were often exploring the shadows around the main themes in wonderfully rich detail. It is interesting to note that Hunter, as well as a skilful improv-jazz drummer, is also involved in dub reggae and this might have come into some of the ways that he found space between the different instruments for his drum patterns. Of course, this makes it sound as if there was a clear demarcation of roles and it is quite clear that each player has equal contribution to make (not just in terms of the credits on the track listing) but also in terms of when and how they take solos across the pieces; occasionally two solos collide and then bounce off each other, at other times an instrument comes to the fore and the others drop back to leave it space. What is delightful about the way that the quartet works here is the way in which there never seems to be any hesitation as to when to play or what to play. There is sense of instinctive collaboration in the ways that each piece develops. Bearing in mind that this set, like that on the first CD, was planned, practised and recorded in a single session, there is a lot to admire in the ways that the players are able to create music. What is even more impressive is that the pieces are of such quality and are so memorable. One of my favourite pieces on this CD was ‘Amanda’s Drum’, track 1, which begins with a sort of saxophone fanfare over jagged piano and skittering drums before dropping into a violin piece that carried the elegiac air of a sonata. The piece felt so well structured that it was difficult to get any sense of the performance being ‘free’. But, what you get on these CDs is the way that Archer (as he’s often done in the past) is able to work with musicians to blur the boundaries between the composed, the improvised, the random and silent spaces in between each of these. – Chris Baber, Jazz Views.